The Altmar-Parish-Williamstown Central School District welcomes Brian Kovalchik as an administrative intern. APW Central School District welcomes Brian Kovalchik as administrative intern. Kovalchik is a U.S. Navy veteran. He received his education degree in social studies from Southern Connecticut State University. 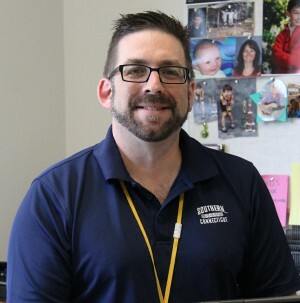 He started working for the APW Central School District in 1997 teaching ninth grade global studies and he also played a role in creating a psychology class that he has taught since 1999. Kovalchik started administrative coursework in 2009 through SUNY Oswego but took a step back with the birth of his youngest son. He said that APW Superintendent Anita Murphy was instrumental in convincing him to finish what he started. “I love working with kids and trying to help what some would consider the more challenging kids decide what is good and what is not good for them,” said Kovalchik. The administrative intern says his goal is to make a contribution to the district and to be more of a benefit to the schools than they are to him. He worked with Superintendent Murphy over the summer and will be working at the junior-senior high school this school year. Kovalchik enjoys country living, working outdoors, hunting and fishing. He and his family reside in the APW school district, his two sons attend the elementary and junior high schools and his wife, Leandra, is on the school board.